Cancer Barked up the Wrong tree! 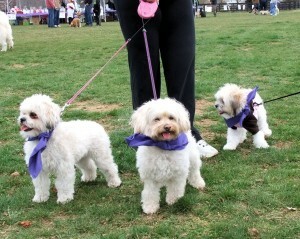 The 2nd Annual ‘Bark for Life’ was held on Sunday, April 10 at Martha Clara Vineyards was a wonderful event and great success! With over 150 people and their dogs in tow, they took strides against cancer, by raising funds for the American Cancer Society and having fur flying good time. With music in the air, wine in some glasses, contests, raffle prizes and fabulous vendors – people came from all across Long Island to take part in the event. The dogs at this event were so were wonderfully behaved, from the tiniest furball to the large mastiffs, Dobermans, Goldens, American Pit Bull Terriers, Boxers and so many different breeds – and they all were having a great time. (And there owners too!) Couldn’t make it? You could still make a donation to American Cancer Society. Can’t wait until next year!